‘The Walking Dead’ Season 4 Recap – Episode 2 ‘Infected’!! This episode of “Walking Dead” covered a lot of territory. There was an amazing amount of character development and change, along with all the craziness of the super flu and the mysterious happenings inside the prison. Lets get to it! In the opening scene, it is still night at the prison. Patrick has just died and awaken as a walker. Outside by the outer gate, there is a person outside with a flashlight feeding the walkers rats. back inside, you see Tyrese and Karen talking about what happened to Zak earlier that day. You can see how close the two of them have gotten over the past few months. They both call it a night and go to their separate cells. Karen goes into the common shower area and washes her face with the same water Patrick coughed in. She hears a noise and sees no one. After she leaves, Patrick gets up and walks onto the cell block. He almost goes into Karens cell, but goes into the a man who coughed. Patrick kills the man. Morning come and Rick wakes up Carl on their side of the prison. Patrick is still feasting on the man in the cell. He hears people waking up and goes after them. The man who was killed wakes up as a walker. Glen and Maggie are sleeping in the guard tower. Glen goes down to go a perimeter check. 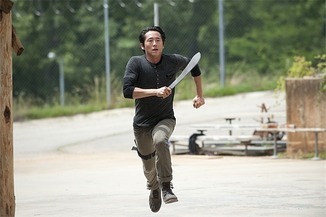 Michonne is getting ready to leave on a run and asks Carl why he doesn’t wear his hat anymore. Carl tells her because its not a farming hat. While Rick and Carl are working on the farm, Carl tells him about the clusters and sees if he wants to help. Rick says he has other things he wants to do, like farm. Carl wants to help and Rick tells him no. Carl apologizes for wanting to help with the fence and asks for his gun back. They then hear gunshots. 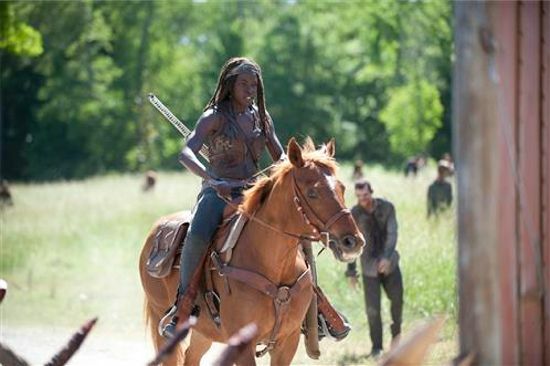 Michonne and everyone run to see what happened. Michonne gets injured throwing off a walker and Carl kills one with a gun. Inside the cell block there is a walker outbreak and mass chaos. Tyresse saves Linda. Carol tries to help a man by amputating his arm, but sees he is bitten on his back and stops. The cell block gets contained with about 15 casualties. Everyone is cleaning up the mess. Carol is helping the man and is given his two little girls, Lizzie and Milka, to look after. Rick kills a walker in the cell and notices how he just died and you can see the blood running off their faces. Rick, Hershel, Daryl , the doctor and Bob all realize that they have a flu epidemic running throughout the cell block. Carol brings Lizzie and Milka to say goodbye. Milka tries to stab her dad after he dies, and breaks down. Rick comes out of the cell block and Carl and Michonne tell him what happened. Rick tells them what happened. Rick tells them to stay away from those who have been exposed. The council sits down to figure out what to do and how to separate everyone. They decide to send people to cell block A. Tyresse and Karen walk by and Karen coughs. Hershel explains to them what is going on and separates them. Daryl and Carol have a moment to see how they both are doing. Daryl says he is ok because he has to be. Carol, Milka and Lizzie talk outside by the gate. Carol tells them that they have to be tough. Milka is upset that the walkers she named are dead. Daryl is out burying bodies and Rick goes out to talk to him. Daryl says that he was good, even without his gun. Rick tells him that he messed up too many times and almost lost Carl due to making too many decisions. During that conversation, Maggie calls them to help at the fence. 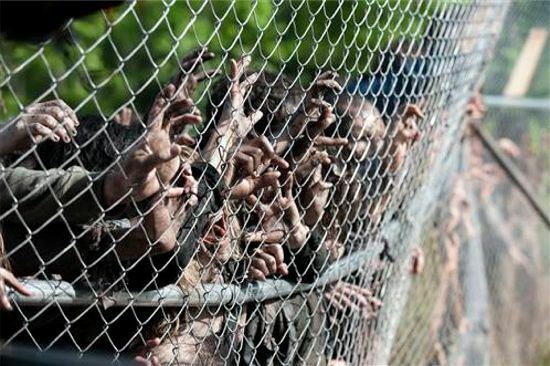 The walkers are about to break down the fence. Beth wraps up Michonnes leg and tells her she is glad she is ok. Beth asks if there were kids and Michonne says yes. Beth talks about how they should give a name to people who lose kids. Judith cries at that moment and it drives Michonne nuts. Back at the gate, Glen, Tyresse and others are trying to clear the fence and they see the rats. Carol goes and talks to Carl about telling Rick about the knife training. Carol does not want Carl to tell his dad and he does want to tell. Beth calms down Judith and Michonne comments on her choice of songs as a lullaby. Judith spits up on Beth and tries to get Michonne to hold the baby. Michonne fights it and eventually does hold her and cries. At this moment, you realize that Michonne lost a child in the apocalypse. Rick has a great idea to lure the walker from the fence using the piglets from the sick mother. Daryl drives the truck and Rick cuts a piglet and drops it. They drop three piglets over the length of the field and every time Rick drops a pig, he slowly breaks down and loses it. I believe that this is when the old Rick slowly comes back and “Farmer Rick” slowly fades away. Carol talks to Milka and Lizzie about how they are sad their dad is gone. She tells them that its ok to be sad. Rick is clearing out the pig pen and talking to Carl. Carl tells Rick about what Carol has been teaching the kids. Carl tell him, “I know that you say that its not up to you, but it can be.” Rick is not going to stop her or say anything. Rick decides to give Carl back his gun and he himself puts his guns on. Rick lights the wood on fire and throws his shirt in. That is the moment of change. Tyresse goes to see Karen and sees a trail of blood leaving her cell. He follows it outside and see her body and another one burned up. This episode builds on the other with the background of the characters. You see a moment of weakness with Michonne when she was with Judith. You also see Daryl in a supporting role to Rick. I believe that Daryl is wanting the old Rick back more than anyone else. The outbreak at the prison shook everyone up and their false sense of security. I cannot wait until the next episode to see how Tyresse handles Karen being gone. Let me know what you think of this episode. This entry was posted on Monday, October 21st, 2013 at 3:04 pm	and is filed under Comics, News, Television. You can follow any responses to this entry through the RSS 2.0 feed. You can skip to the end and leave a response. Pinging is currently not allowed.